Posada (meaning “home” or “lodging”) is an old Mexican tradition where young people dressed as Mary and Joseph travelled from house to house asking for a room for the night and telling people about the imminent arrival of Jesus in the weeks leading up to Christmas (Advent). On Christmas Eve they would visit the local church to re-enact the nativity and place figures of Mary and Joseph in a crib. 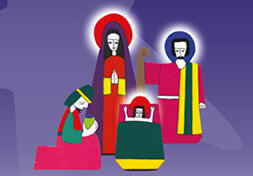 Modern-day Posada uses nativity figures of Mary and Joseph who travel from place to place. This gives each ‘host’ the chance to create their own celebration in their home or place in the community, worshipping and reaching out to their communities with the real message of Christmas, making room for Jesus in their lives. Rustington Methodist Church has chosen to practice Posada this year. Will you be a host to Mary and Joseph for a night? All you need to do is add your name to the Journey Rota which you will find in the church entrance (from November 26th) for a night that will suit you to ‘host’ Mary & Joseph. Another person from our community will make arrangements to bring the figures to your place at a time to suit both of you. Perhaps you could prepare a place for the ­figures and put a candle nearby which can be lit when the travellers arrive. You may wish to use a prayer there are some suggestions on the page below. If you would like to see photographs of Mary and Joseph and what other people did on their hosting day, click on the link below. At the end of your “day” Mary & Joseph need to get to the next host on the Journey Rota. Add your details to the Journey Rota as soon as possible after November 26th. Please consider getting involved. We hope you will enjoy taking part.